The American Pit Bull Terrier ( APBT ) is a medium sized breed of dog. It has short hair which is relatively smooth to the touch. Pit Bulls come in all colors and patterns. The Pit Bull breed has been developed over hundreds of years to be a worker and is well suited to most any task requiring strength, agility, and intelligence. 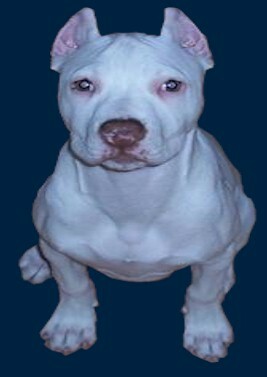 A well developed American Pit Bull Terrier ( APBT ) should be muscular in build with well pronounced chest and legs. A Pit Bull's head is often described as brick-like but is actually more in the shape of a wedge. 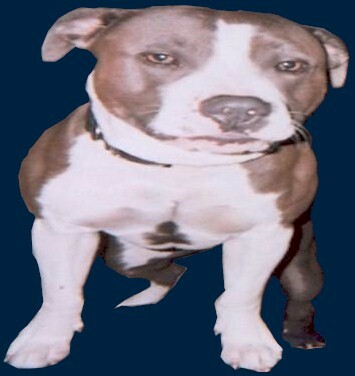 The muzzle of the Pit may vary in length but a Pit with a well developed head will have a wide muzzle at maturity ending at a muscular jaw. Pit Bull's eyes are round or oval in shape and come in all colors including blue which is caused by the Merle gene. Merle genetics may also reveal itself in blotches on the coat and is typically manifested this way in reds and blues. A well-mannered and properly socialized Pit Bull will exhibit confidence in most every situation. When a task brings itself to light the Pit Bull is typically inquisitive and exhibits a can do and don't give up attitude. The Pit Bulls intelligence is unsurpassed and can get it into trouble sometimes once it figures out it is a natural escape artist and can climb trees almost as good as a cat. Because of this ability it is of the utmost importance to keep objects and trees away from any fences that are intended to confine them. Pit Bulls have a natural tendency to want to please their owners and strive for human attention. Pit Bulls make excellent family pets but should be watched around children as their exuberance, size, strength, and weight may be overpowering.